Die noch recht junge Band Oldthink ist dabei auf dem deutschen Musikmarkt Fuß zu fassen und dabei wollen wir sie tatkräftig unterstützen. Die beiden Italiener Lorenzo Pascazi und Matteo Basile haben sich Ende Juli 2013 zusammengetan und zunächst eine Tribute-Band gegründet, mit der sie sich etablieren wollten. 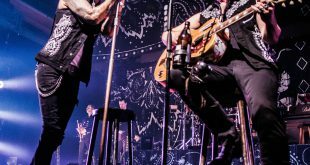 Gegen Ende des Sommers wurden sie quasi entdeckt, haben Alessandro Sassano und Andrea Valentini mit in die Band geholt und bei DM2.0 Promo Booking Unterzeichnet und seither arbeiten sie hart an ihrer Karriere. Wenige Wochen später kam ihre erste EP Between Love and Pain bei Carosello Records auf den Markt. Schon bald darauf gab es einen Besetzungswechsel, der Drummer Davide de Santis stieß zu ihnen und Matteo und Andrea verließen die Band. So ist die heutige Konstellation und die drei scheinen perfekt aufeinander eingespielt zu sein. 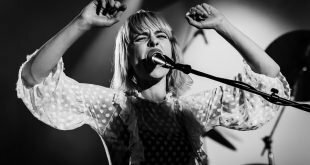 Sie haben eine Vision und diese wollen sie umsetzen: Menschen die Liebe zur Musik wieder nahe zu bringen, spüren zu lassen das Musik Kunst ist. Diesem Ziel kommen sie Schritt für Schritt näher. Please at first introduce yourself to your Fans. 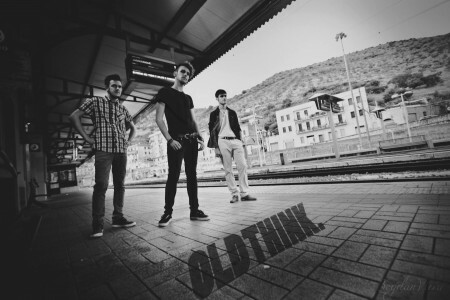 Hey guys, we’re Oldthink., an Alternative Rock new band born on July 2013. We are a band of three: Alessandro Sassano (rythm guitar), Davide De Santis (drums) and me, Lorenzo Pascazi, lead guitar, singer, and co-creator of the band together with Matteo Basile (ex bassman). When Andrea Valentini (ex drums) and Alessandro (guitar) joined the band, we produced our first E.P. „Between Pain and Love“ with the independant label DM 2.0 (now available on iTunes). In the last months, with Davide taking Andrea’s place and Matteo not being part of Oldthink. Any more, we signed a contract with our first manager and recorded two new tracks, both of which are alternative rock in sound such as the space rock „Universal Revolution“ and a reinterpreted version of „What is Life“. We hope you’ll like our sound! How long are you playing Music? We have all been playing music for a long time. I started to play piano at the age of 10, but then moved on to guitar at 14, and singing lessons came soon, too. Davide and Alessandro were into music very early as well. Music is a HUGE part of our life, without it we couldn’t speak about our ideas, our feelings and experience… it makes us alive! And we wouldn’t have it any other way. Now we just hope it’ll become our job very soon. What about the band ? How have you find together and where have you found the name? We’re a particular band. Every member of Oldthink. Has his own music preference but they are all connected, they are all nuances of the same style. That’s how we create our music, by working together despite the genre differences. And now, the name of the band… good question. Well, last year, Alessandro and I were looking for the right name but what we came up with („Underground“ or „Black Celebration“) didn’t work for us. Then I thought about the book my Italian teacher had assigned for the summer… it was „1984“ by Orwell. At last, thanks to it and its „nonspeak“, we found the name Oldthink..
Is that true that you will change your name? Why? Have you ever played outside Italy? Unfortunately no, but we want to get out from Italy and play our songs in Europe and across the world. And that’s what we’re working at with our manager. What is your wish for the future, where do you want to be on stage ? Oh, great question! Now, I’ll tell you this: we want WEMBLEY. It’s our lifetime dream, and we’re working for it because then, at last, we’ll know we’re just where we wanted to be. Ok! Well, on June 2014 our first E.P. „Between Pain and Love“ came out on iTunes but that was our „old school“, what we were; every track had a different style reflecting the former Oldthink. members. But the editing was awful, it penalized us and we weren’t satisfied at all with the result. And I had a sore throat on those days. But now, with the release of the new single „Universal Revolution“ and the new version of „What is Life?“ you can really listen to the new Oldthink. sound and hear how we’ve improved. And soon there’ll be two new songs, for a total of four self-produced tracks. Playing, playing and playing! Every single day! Our goal as a band is to become professionals and we will NEVER stop, not even when we reach our destination. Do you want to say something especial for your fans? I just want to say… thank you, to all of you. Thank you for listening to our music and for supporting the band. We need you to stay with us, because we’ll be sharing every single experience with you from now till the day we make it to the top, and beyond. It’s time to say goodbye but don’t forget more news are coming! A special thanks goes to Darknews for the Interview. Wir sagen vielen Dank an Lorenzo und wir wünschen euch weiterhin viel Erfolg!